At this year’s Summer Day I showed an old quilt. The top had originally come from Wilmington in Ohio. It was for a double bed and showed the “Dresden Plate” design. I have included a photo of it finished (right). Many of you expressed your interest in the story, so here is its history. It was acquired by one of my neighbours. Her brother-in-law had a working contract in Wilmington, Ohio. One day her sister was in a shopping mall where there were Art and Crafts and Antique stalls. When looking through an old box, she found an old quilt top, and thought of her sister, who although not a quilter, liked to have “crafty” country style items in her house. So she bought it for $5. Dorinda, my neighbour, mentioned it to me and I agreed to help her with it. When I first saw it, the quilt was sandwiched with very thick polyester wadding and backed with Laura Ashley curtain fabric. We took it apart, and tacked it up again using Hobbs Premium Cotton Batting, with ivory cotton sheeting for the backing. I had to do some minor patching where the cotton had worn away. Dorinda had a go at hand quilting, but struggled. 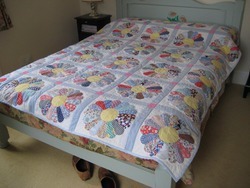 Joan Tunstall came to our rescue, and finished it with her beautiful hand quilting. 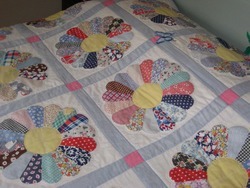 I then finished off the quilt, binding it with light blue fabric. From the evidence of some American Quilters who were staying with Christine Badger, the fabrics are typical of the 1930’s. So it really is a piece of History.